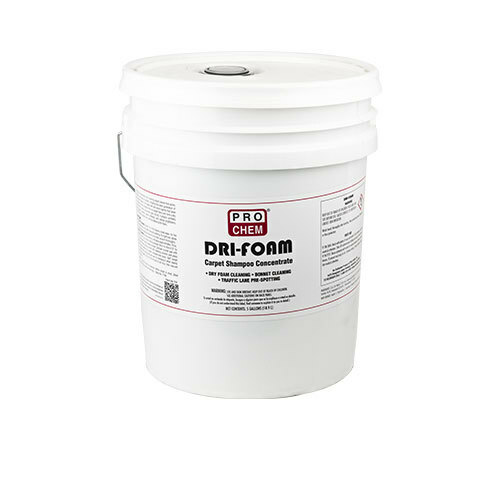 Dri-Foam | Pro Chem, Inc.
DRI-FOAM is a heavy-duty, concentrated, high-foaming carpet cleaner that works effectively on all types of carpets, including the latest generation of stain resistant carpets. Formulated with anti-resoil agents that leave an invisible non-tacky protective film on carpet fibers and form a dry residue which is easily vacuumed upon drying. Contains synthetic wetting agents, solvents, water softeners, and optical brighteners that will brighten carpet colors without attacking the fibers. Dry foam cleaning: Dilute 1 to 10 for heavily soiled areas, for the first few cleanings, or for traffic lane prespotting. For light soil, dilute 1 to 25. Shampoo carpet and allow to dry, then vacuum thoroughly. Bonnet Cleaning: Dilute as above, and spray approximately 10 sq. meters (100 sq. ft.) at a time, holding sprayer 30 cm to 40 cm (12” to 16”) above carpet. Avoid soaking carpet. Dampen bonnet pad with water, do not soak. Spray bonnet with cleaning solution and place bonnet under machine on carpet, sprayed-side down. Buff carpet over sprayed area, turning the pad over or changing it when heavily soiled. Allow carpet to dry for 30 minutes to an hour, then vacuum thoroughly. NOTE – If furniture must be replaced before carpet is dried, place cardboard strips under furniture legs. Not recommended for steam cleaners.